This is the first of my DIY posts!, I am very excited to share with you all the things that I make for my kids, better half, myself and the house! I hope you enjoy this section! 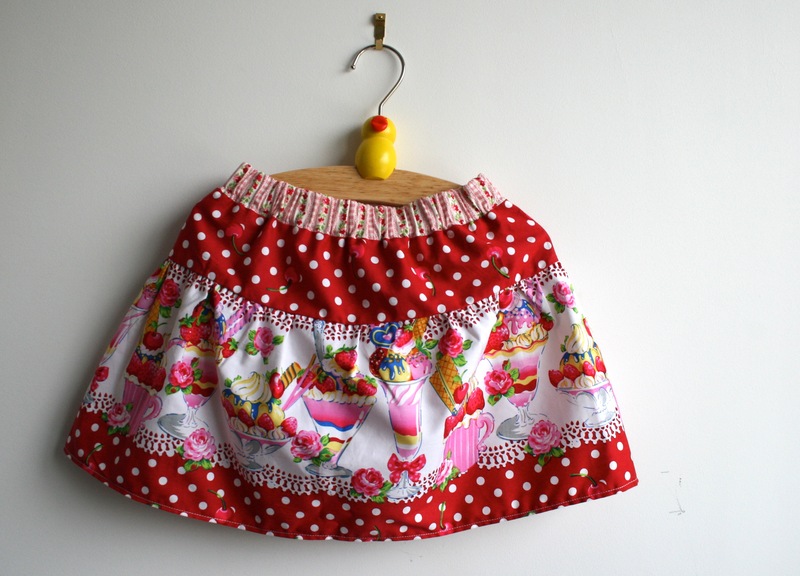 Make this lovely girl’s skirt, it’s easy! And for the skirt I cut 104cm (41 inches) by 20cm (7.9inches) with another flowery fabric. You will also need some elastic for the waist. Seams allowances is 1cm (1/4 inch) already included. Sew the skirt side seam, attach the waist to the joke and sew the seam too. Here now I go over all the edges and I make a zig zag stitch all around, if you have an overlocker well you know what to do then! With right sides together, pin the skirt to the joke and sew. I like to iron all the seams as I go along, it just makes for a much better finished. Leaving a gap to introduce your elastic. I have twin girls… so I also made this one! And a little something to go with it! Next articleSimply Crochet Magazine featured my amigurumi pumpkin toy pattern!